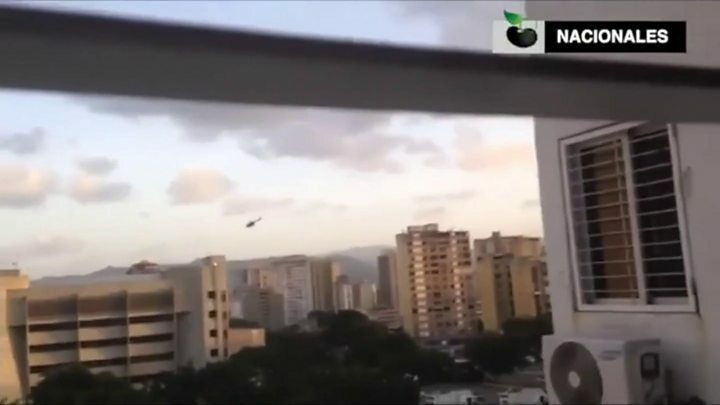 A helicopter has attacked Venezuela's Supreme Court in what President Nicolás Maduro called a "terrorist" incident. Four grenades were dropped on the court and 15 shots fired at the interior ministry on Tuesday, officials said. Rogue policeman Oscar Pérez said he had piloted the stolen helicopter to attack what he called a "criminal government". His whereabouts are unknown. Venezuela is in the midst of a political and economic crisis that has sparked mass protests. What is behind Venezuela's turmoil? Many of those opposed to Mr Maduro see the Supreme Court as one of his main supporters. Images on social media showed two occupants, one masked. The government said 15 shots were fired at a social event at the interior ministry. The helicopter then flew to the court and dropped four Israeli-made grenades of "Colombian origin". One failed to detonate. President Maduro appeared on state television to denounce the attack. He said: "I have activated the entire armed forces to defend the peace. And you can be assured that sooner or later, we are going to capture that helicopter and those that carried out this terror attack against the institutions of the country." Information Minister Ernesto Villegas said the military had been deployed to apprehend the pilot and recover the German-built Bolkow helicopter. State TV showed images of the pilot in front of the US Capitol building in Washington. Mr Maduro has long claimed the US government is attempting to have him overthrown. The government has urged calm but called for its supporters to rally outside the presidential palace on Wednesday morning. Freddy Guevara, of the opposition MUD alliance, said there was not yet enough information to comment on the attack. But he posted a tweet on Wednesday calling on people to continue to oppose the Maduro government. He said: "Maduro knows that nobody supports him, so today more than ever we must continue in the street, generating pressure to overcome this dictatorship!" Some of the president's opponents took to social media to suggest he was responsible for staging the helicopter attack in order to justify a further crackdown on dissent. The police officer identified himself as Oscar Pérez in video statements posted on the social media platform Instagram. Appearing in military fatigues and flanked by armed, masked men in uniform, he appealed to Venezuelans to oppose "tyranny". "We are a coalition of military employees, policemen and civilians who are looking for balance and are against this criminal government," he said. "We don't belong to any political tendency or party. We are nationalists, patriots and institutionalists." He said the "fight" was not against the security forces but "against the impunity of this government. It is against tyranny". It is not clear how much support, if any, the officer has. Mr Maduro said the pilot had previously worked for former Interior and Justice Minister Miguel Rodriguez Torres, who the president has accused of links to the CIA. Mr Rodriguez Torres quickly denied any involvement. The sight of an apparently disaffected member of the security forces dropping grenades on the Supreme Court and allegedly firing on government buildings is extreme, even by Venezuela's standards. Whether "Oscar Pérez" is indeed part of a coalition of like-minded "military employees, policemen and civilians" or just a rogue policeman is hard to say. Certainly President Maduro was quick to dub the incident "a terrorist attack" and used it as a reason to "activate" the armed forces to keep the peace. However, earlier in the day he, too, had thrown down the gauntlet to his opponents. "If the Bolivarian Revolution were to be destroyed," he said, "what couldn't be done with votes, we would do with arms." The opposition in Venezuela took that as an overt threat. The security situation in Venezuela could hardly be worse ahead of a highly controversial election next month over the government's plans for a new constituent assembly. There have been almost daily anti-government protests in Venezuela for over two months as the country's economic and political crisis worsens. Those opposed to the government say they are determined to keep protests going until fresh elections are called and the government is ousted. More than 70 people have been killed in protest-related violence since 1 April, according to the chief prosecutor's office. Could this have been a coup attempt? President Maduro was quick to suggest it was a coup attempt, but it is unclear how much support the police officer has. Earlier on Tuesday, Mr Maduro reiterated his allegations that the US was supporting coup attempts against his government. On Monday, he announced that five people had been arrested, accused of plotting against him and preparing for a US invasion.